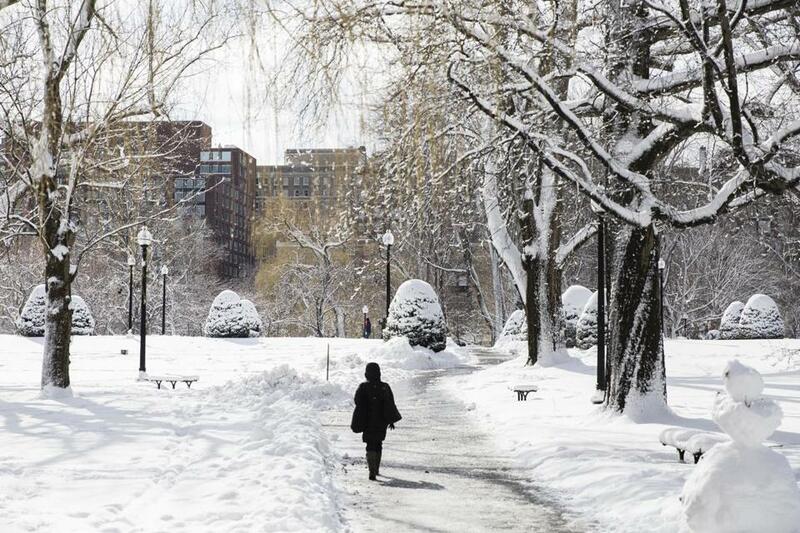 People walked along snow covered paths in the Public Garden in Boston. After weathering three nor’easters and with spring due to start Tuesday, Greater Boston faces the possibility of even more snow later this week. The cause is a rogue coastal storm that could make its way up to New England from the mid-Atlantic Wednesday into Thursday. If the storm stays on course snow could start falling Wednesday afternoon, said Kim Buttrick, a meteorologist with the National Weather Service. “There’s still a lot to see with how this storm moves, but our current thoughts are that Boston and areas to the south of it could see some snow,” said Buttrick. On Sunday evening, NWS meteorologist Matt Doody told the Globe that the storm models appear to be moving further west, which slightly increases the probability that snow could accumulate in southeast New England. The potential for snow is highest in the Cape and Islands, Doody said. Forecasters did not have an estimate for how much snow Greater Boston could expect, but put the possibility of accumulation at 30 percent. Sunday was sunny with a high of 34 degrees, but windy as gusts of up to 24 miles per hour blew in from the northwest, according to the weather service. The cold did not dissuade crowds in green from turning out in below-freezing temperatures -- and windchill of minus 13 -- to watch the city’s 117th annual St. Patrick’s Day Parade. Monday is expected to reach a high of about 38 degrees with northwestern winds of 10 to 13 miles per hour. Gusts of up to 23 miles per hour are also expected, according to the weather service. On Tuesday, temperatures should reach about 34 degrees, according to the National Weather Service. Wednesday is expected to be cloudy with a high of 36 degrees and the snow beginning in the early afternoon and continuing into Thursday morning, according to forecasters. Thursday is expected to be partly sunny with a high of39 degrees, according to forecasters.